We designed the Big Bell® Stone Series® Saxophones for you to be able to play without limits, feeling each note vibrate in your hands. 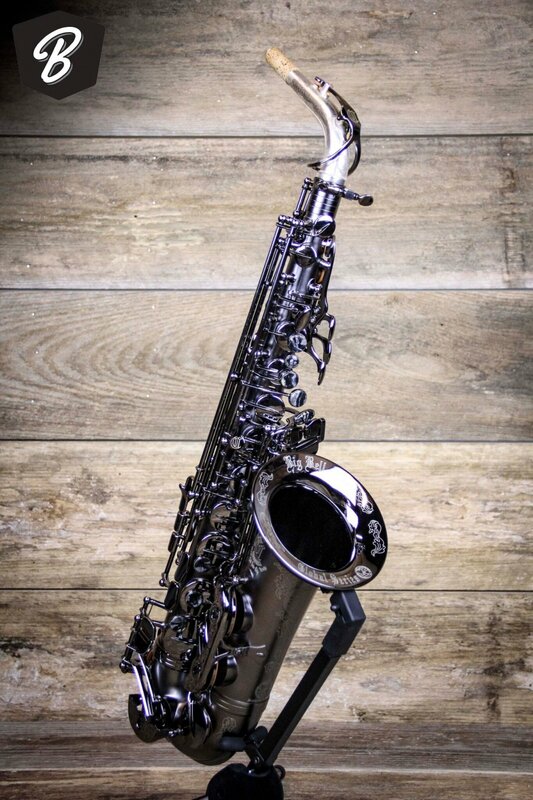 The combination of fine hand-engraving and semi-precious natural stone touch pieces from the deep earth make each saxophone an art piece in itself. Each Cannonball Big Bell Stone Series Alto Saxophone comes with two necks, an original neck and Cannonball's patented silver-plated Fat Neck®. For Brute models, both necks come in the Brute finish. Each Big Bell® Stone Series model comes with our proven Big Bell design loved by many of the greatest saxophonists in the world including Gerald Albright, Eric Darius, Najee, Paul Taylor, and many more. The Stone Series® is adorned with semi-precious stones. These beautiful stones give the instrument a striking look, as well as changing the way the instrument resonates. This is a USED instrument being sold in 'excellent' condition. Two necks and Case are included. Thanks for shopping with BME!